Golfing, traveling, attending sporting events. 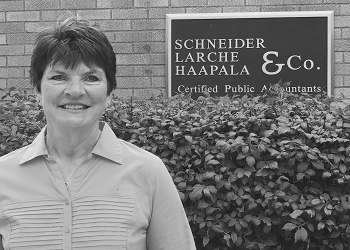 Sue has worked for Schneider Larche & Haapala since 1993. She joined the firm as a receptionist. Sue is now involved with many operations of the firm such as accounts receivable, collections, facilities, and insurance. Sue sits on the Board of Directors for the Delta County Chamber of Commerce and Delta County Convention and Visitors Bureau.